The Scientists New Jersey guest star, Valerie Graham, gives us her thoughts on Marie Curie, trampolines and the history of New Jersey. SCIENTISTS: Tell us a little about yourself. S: What was the last show you did? V: A show I wrote. Writing is fun. And stressful. Deadlines are real and typing can only go so fast. I found ad-libbing within my own structure to be incredibly freeing. I tend to get nervous during shows, so it was nice to let that go. S: The Scientists is a historical farce, what is your favorite little-known or wacky historical fact about New Jersey? V: Here’s the thing. I moved from New Jersey when I was 8. I’m pretty sure that’s right before they teach history or geography. So….something something colonies….something something settlers? S: What is the one thing The Scientists crew can't miss while visiting New Jersey? V: My childhood home. Or the park at the end of the street. Just at the end of Wingra Ave. You’ll see it. S: If you were a scientist, what would you invent? V: I want to be a physicist. I mean to transition careers. I’ll invent facts about the universe. S: What do you think about the real life Marie Curie? S: Someone tipped us off that Marie may do a bit of burlesque in the show, have you ever done burlesque before? V: No. If I ever do burlesque it’ll be under the name Choo Choo. And I’ll dress in a boxy train costume. I’ll make great coal and caboose jokes. I’ll obviously sing a song called Trolly Folly. S: Any other big plans for this fall? V: Saving for a trampoline. Catch Valerie in The Scientists performing at 1978 Maplewoood Arts Center (1978artscenter.org/) Sunday September 28th at 5:00pm. Click here for more tickets and more info! Our newest guest star, Mandy Hassett, talks all things Rochester--garbage plates, world peace, and Buffalo Bill! The Scientists team is ecstatic to announce that Rochester native Mandy Hassett will be guest starring in the role of Marie Curie at the First Niagra Rochester Fringe Festival September 25-27 at the Geva Theatre Center Fielding Nextstage! Check out our exclusive interview where she gives us the scoop on her hometown. MANDY: I'm a Rochester native, I love my family and friends, the Buffalo Bills, Disney princesses, and the theatre! M: I was in Nunsense at Blackfriars Theatre here in Rochester. I played Sister Mary Amnesia with a group of Rochester's finest actresses! S: The Scientists is a historical farce, what is your favorite little-known historical fact about Rochester? M: I just found out that Buffalo Bill Cody lived in Rochester in the 1870s and has three kids buried in Mt. Hope Cemetery. He was one of the headliners at the 1889 World's Fair in Paris! Wacky! S: What is the one thing The Scientists crew can't miss while visiting Rochester? M: That would have to be trying a Garbage Plate from Nick Tahou's. It tastes a lot better than it sounds! M: I would invent a world peace button. As soon as I pressed it, all the fighting and war would stop, and we would just be nice to one another and the world would be one big party! M: She was pretty awesome! Two Nobel Prizes? That is crazy cool! M: I have some fun things coming up including choreographing Babes in Toyland for the Rochester Association of Performing Arts (RAPA), watching a whole lot of football, and eating a whole lot of pumpkin pie! Catch Mandy in The Scientists performing at The First Niagara Rochester Fringe Festival (rochesterfringe.com) Thursday September 24th at 7:30pm, Friday September 25th at 7:30pm, and Saturday September 26th at 6pm at the Geva Theatre Center Fielding Nextstage (75 Woodbury Boulevard). Click here for more tickets and more info! Piquod's Pizza- the best in town! View from the architecture boat tour! Thanks to the Chicago Fringe staff, artists, and volunteers--especially our honorary Scientist, Laura--for a great run in Chicago! 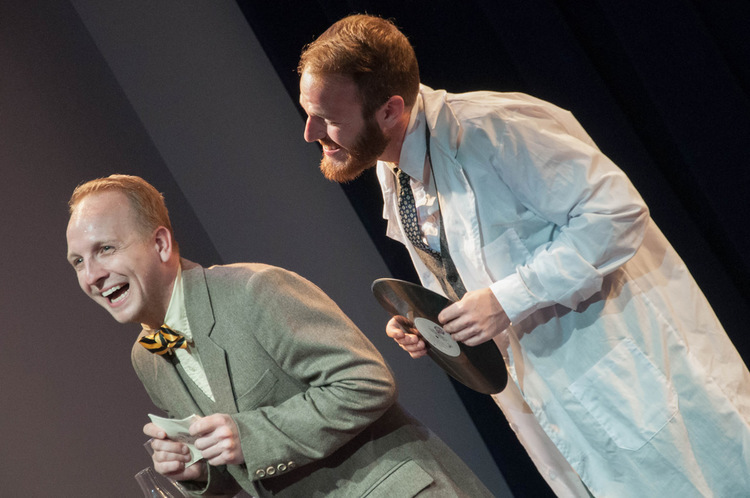 In June, The Scientists hit the road for Portland, ME and the Portfringe '14 theatre festival. Check out some of our favorite production stills from the show! The Scientists are coming to NJ! We are excited to announce a new stop for The Scientists: 1978 Arts Center in Maplewood, NJ! This one night only engagement will take place on September 28, at 5pm! Tickets will be available soon, so check back for more information! The Scientists crew would like to give a HUGE thanks to everyone who came out to support us in both NYC and at the PortFringe over the past week! UN PETITE SNEAK PEAK After some tough editing decisions and many hours of rehearsal at our CT home base--the Casa Costello--we were finally ready to put the show in front of its very first audience at our preview performances in NYC! We could not have been more thrilled or excited to share this show for the first time! We had a blast and we hope that you did too! LOBSTER! LOBSTER! LOBSTER! Next, we made our way north to PortFringe 2014! Our guest performer Eliza McCoy showed us what it was like to be a true Mainer and she killed it as Marie Curie! After two great performances, a booze-soaked preview of the show with The Scientists: Research & Debauchery and a lot of lobster rolls, we can safely say Portland was a great way to debut The Scientists! HOME AWAY FROM HOME A very special thanks goes out to both Mark & Deborah Costello who hosted all of The Scientists for rehearsals in Connecticut, as well as Jim & Kelly McCoy who hosted the whole crew in Maine. Your generosity and kindness is deeply appreciated. And to quote Adolph Weiss "You're Scientists now!" BACK TO THE LABORATORY With our first stop behind us, we head back to the laboratory before hitting the road for our next show at the Chicago Fringe festival! Stay tuned for more photos of the trip (there may have been a Beach photo shoot...) as well as additional dates and cities for The Scientists! Can't get enough of The Scientists? Curious about how the show was developed? Want to get drunk with us? Well you're in luck! 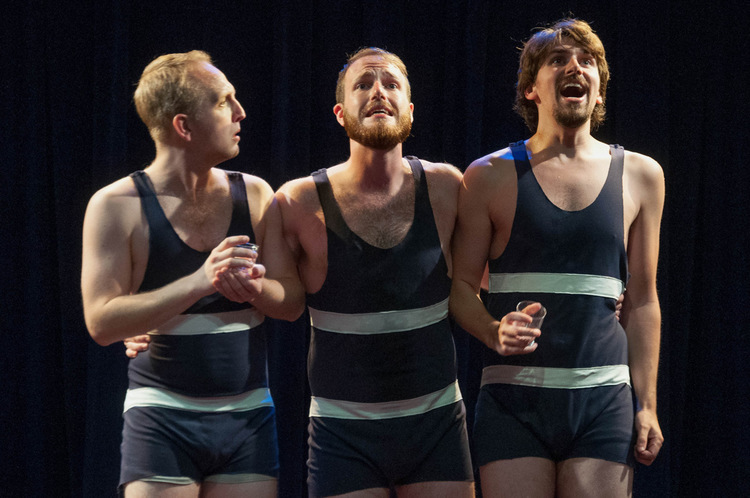 We're happy to announce The Scientists Lab: Research & Debauchery at the PortFringe 2014! Join us for a look behind the scenes and under our lab coat during this interactive evening with the cast and crew of The Scientists! Get an insight into our process as we perform some never before seen material as well as a sneak peak of the show. Grab a drink at the door and play a drinking game as you watch - we'll be playing along! This show is a DOUBLE-TICKET which means you get TWO shows for the price of ONE! You'll also catch Society for the Preservation and Promotion of Sapphic Social Mores (SPPSSM). Check out their Facebook Page here! We talk lobster, Beyonce, and burlesque with ELIZA MCCOY who will be guest starring as Marie Curie in the Portland, ME production of The Scientists. SCIENTISTS: So Eliza, tell us a little about yourself. ELIZA MCCOY: I am an NYU drama student going into my senior year, a Mainer at heart, and a lobster enthusiast! S: Let's talk Maine. What was the last show you did there? EM: I was in the company at The Arundel Barn Playhouse last summer. The season included Chicago, Shrek and All Shook Up! S: Some of The Scientists crew have never been up to the Pine Tree State. What is the one thing we can't miss while visiting Portland? EM: THE LOBSTER. It is truly all it is cracked up to be. Also...if anyone has a chance, the Portland Seadogs games are something to see. A lighthouse emerges from the field during the 7th inning stretch! "Marie & Beyonce would've been friends"
EM: I think if Beyonce had been alive in the late 1800's, they would have been friends. She is a fierce lady. She was the first woman to win a Nobel Prize, the only woman to win in two fields, and the only person to win in multiple sciences. She also was the first woman (in 1995!) to be placed in the Pantheon in Paris because of her own accomplishments. As far as the love affair scandal, I think it was fabulous. I mean, what else are you supposed to do after your husband is run over by a horse? S: Someone tipped us off that Marie may do a bit of burlesque in the show. Have you ever done burlesque before? EM: A radioactive woman never reveals her isotopes! S: If Eliza McCoy were a scientist, what would she invent? EM: This is a tough one. I think teleportation would be the handiest thing in the world. S: The play is set at the 1889 World's Fair in Paris, and you recently spent a semester there, what's your favorite thing about Paris? EM: I loved how sometimes it felt like you could travel back in time just by turning down a new little street. There is something so preserved about life there. Of course, they do have all of the amenities of 2014...but at times I really did feel like Hemingway was going to pass me on the street! The jazz clubs were one of my highlights! S: After The Scientists, do you have any other big plans for this summer? EM: I will be performing in a brand new musical by two composers from the NYU Graduate Musical Theater Writing program in August! Catch Eliza in The Scientists performing at PortFringe 2014 (www.portfringe.com) June 27th at 10pm and June 29th at 12pm in the Portland Stage Company Storefront Theater! Click here for more info! Check out new photos from a reading of The Scientists in April 2014! 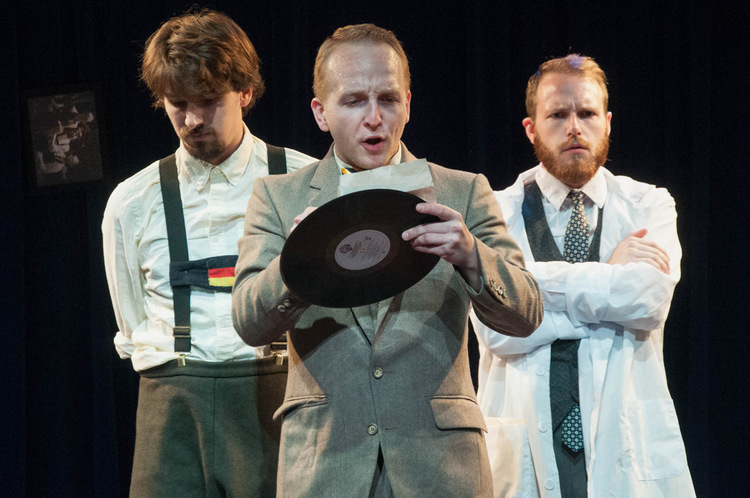 Check out our new promo video for The Scientists featuring original music from the show! Marie Says: "I got all gussied up in my World's Fair best, just for you!" $3,000! Thank you to all of our funders for your support! We've still got a ways, so let's keep it going!